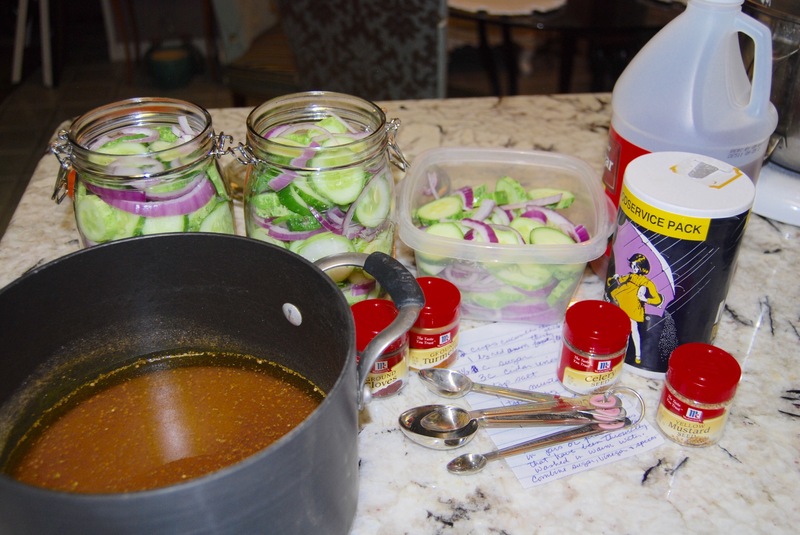 Super simple recipe that anyone can do and conquer canning! I’ve tried growing a couple of pickling cucumber plants each spring, but never had much luck with them. Never enough to to make a batch of pickles. Just a few to add to cucumbers I pick up at our farmers market. This year was quite different with all the rain we had this spring here in Waco. There was flooding in places all over Texas. So much that it made the national news. The natural pool at Tonkawa Falls in Crawford was higher than we had ever seen it before. Wish we still had some of that rain lingering around. The fall’s swimming area has already been closed because of its dramatic drop making the water stagnant. Hopefully we will see rain again soon. Anyway, all that rain made for a bumper crop from my two little plants. 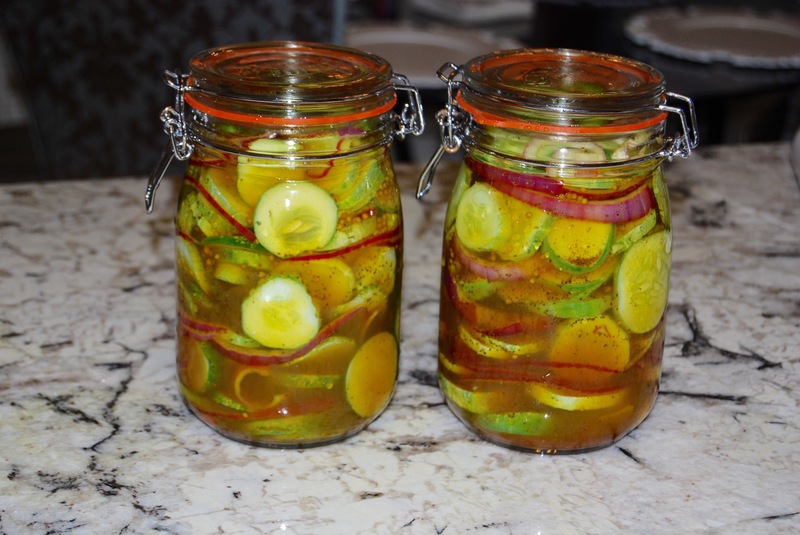 I was able to make my zesty pickles with cucumbers just from my little garden. 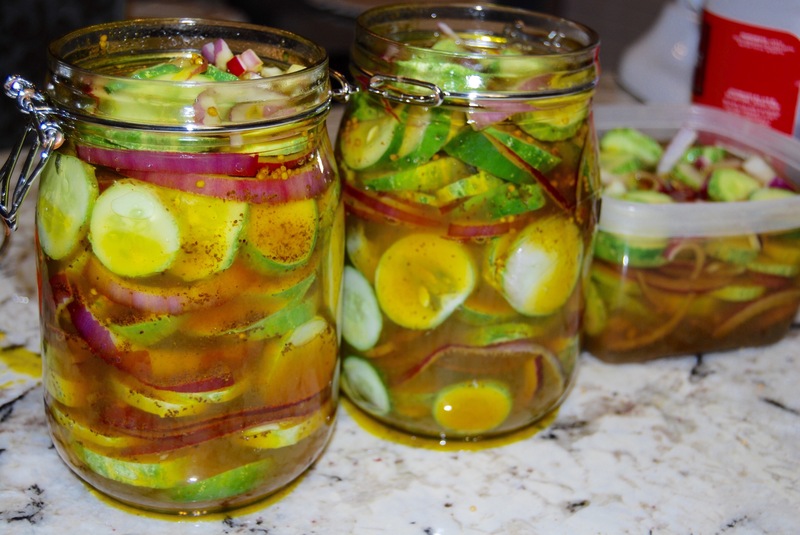 These are great pickles that you don’t have to go through all the trouble that goes along with full fledged water bath canning. It’s a very forgiving recipe too. You can easily adjust this recipe to depending on the number of pickling cucumbers you have or add a little more spice if you like yours hot. I bought some kinda fancy jars I found at our neighborhood grocery store, but you can use just about any jar or container as long as you wash them really well in hot, sudsy water. 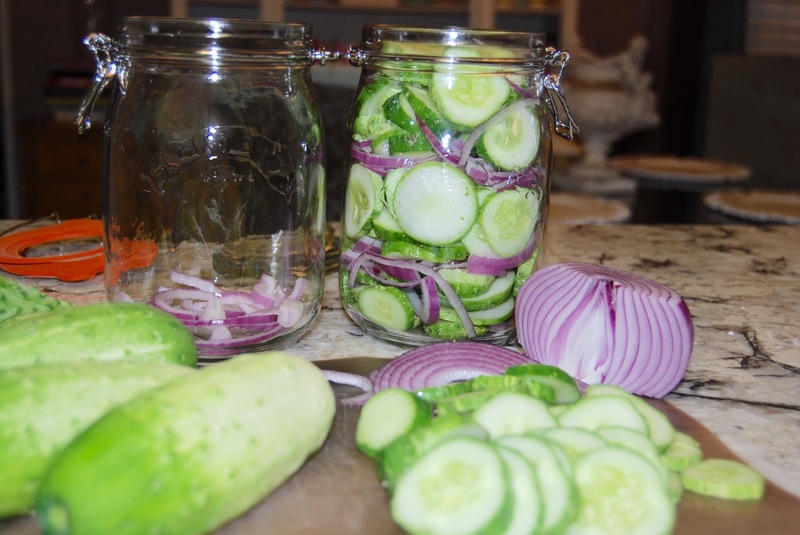 Layer cucumbers and onions in jars or refrigerator containers that have been throughly washed in hot soapy water. Combine sugar and all spices in a large saucepan mixing well. Add apple cider vinegar to mixture, stir continually and bring to a simmer over medium heat to dissolve sugar. Carefully pour hot mixture over cucumbers and onions. Cover tightly and store in refrigerator at least 24 hours. Will stay fresh in the refrigerator until all are used. *be sure to clean up any spilled liquid right away as it can stain your counter top!! Wooh! Almost learned this the hard way!! I will have to try this! Thanks for sharing!!! !